Ferdinand VI (Spanish: Fernando VI; 23 September 1713 – 10 August 1759), called the Learned (el Prudente) and the Just (el Justo), King of Spain from 9 July 1746 until his death in 1759, was the third ruler of the Spanish Bourbon dynasty. He was the fourth son of the previous monarch Philip V and his first wife Maria Luisa of Savoy. Born at the Royal Alcázar of Madrid, Ferdinand endured a lonely childhood. His stepmother, the domineering Elisabeth Farnese, had no affection except for her own children, and looked upon Ferdinand as an obstacle to their fortunes. The hypochondria of his father left Elisabeth mistress of the palace. Ferdinand was by temperament melancholic, shy and distrustful of his own abilities. When complimented on his shooting, he replied, "It would be hard if there were not something I could do." Shooting and music were his only pleasures, and he was the generous patron of the famous singer Farinelli, whose voice soothed his melancholy. Ferdinand was married in 1729 to Infanta Barbara of Portugal, daughter of John V of Portugal and Maria Anna of Austria. Prominent figures during his reign were the Marquis of Ensenada, a Francophile; and José de Carvajal y Lancáster, a supporter of the alliance with Great Britain. The fight between both ended in 1754 with the death of Carvajal and the fall of Ensenada, after which Ricardo Wall became the most powerful advisor to the monarch. Church relations which were really tense from start of the reign of Philip V because of the recognition of Charles VI as the King of Spain by the Pope. A regalist policy was maintained that pursued as much political as fiscal objectives and whose decisive achievement was the Concord of 1753. From this the right of Universal Patronage was obtained from Pope Benedict XIV, giving important economic benefits to the Crown and a great control over the clergy. The death of his wife Barbara, who had been devoted to him, and who carefully abstained from political intrigue, broke his heart. Between the date of her death in August 1758 and his own on 10 August 1759, he fell into a state of prostration in which he would not even dress, but wandered unshaven, unwashed and in a nightgown about his park. The memoirs of the count of Fernán Núñez give a shocking picture of his deathbed. 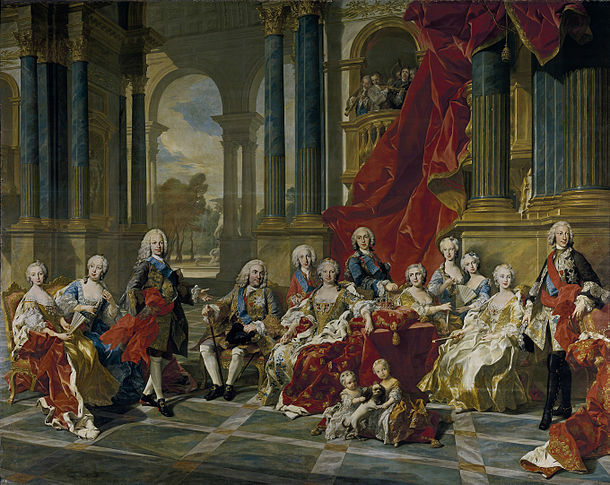 As the couple had no children, Ferdinand VI of Spain was succeeded as King by his half-brother Charles III. A fictionalized version of Ferdinand VI appears in the 2011 adventure film Pirates of the Caribbean: On Stranger Tides. In the film, after learning about the discovery of the Fountain of Youth, Ferdinand (portrayed by Sebastian Armesto) sends his most trusted agent, known only as the Spaniard, to find and destroy the Fountain, because he saw it as the abomination in the eyes of God. Also, his residence, for unknown reasons, is situated in Cádiz, not in Madrid, the true capital of Spain. ^ a b c d e This article incorporates text from a publication now in the public domain: Chisholm, Hugh, ed. (1911). "Ferdinand VI. of Spain" . Encyclopædia Britannica. 10 (11th ed.). Cambridge University Press. p. 267. ^ Rodríguez de Maribona, Manuel Las armas del Príncipe de Asturias - ABC. (in Spanish) Accessed 2009-05-28. ^ "Fernando VI, Rey de España (1713-1759)". Ex-Libris Database (in Spanish). Royal Library of Spain. Retrieved 18 March 2013.